The first part of this ongoing series had more than a few surprises in it. 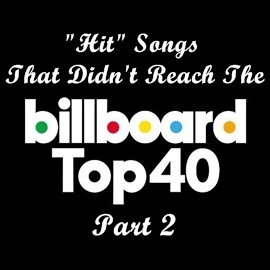 Songs that you thought must have hit the Billboard Top 40 pop list never actually did … but the five examples on today’s list are even more surprising. Three of them never reached the Top 100! We start with a song celebrated for being one of the most powerful civil rights statements of a generation, followed by a song that was and remains a national treasure in England but didn’t cause a ripple in the U.S. Third on the list is a song by a band which had two #1 hits in 1965 but their first single of 1966 brought them back to earth in a hurry. The fourth song was the signature tune for one of America’s most beloved bands (but you’ll have to play it to find out who because I’m not giving it away), but when it was released, it was a major bust. And finally, one of the most iconic songs of the 70s charted much lower than you probably thought. This one defies belief; so much so that I’m not naming the artist for this one, either. You’ll recognize the song within two seconds, maybe less. If you don’t instantly know it, you shouldn’t be here. Bob Dylan (1963) … Did Not Chart! Gerry & The Pacemakers (1963) … Did Not Chart! The Byrds (1966) … Peaked at # 79! I’m Not Telling You (1977) … Did Not Chart! I’m Not Telling You (1972) … Peaked at # 52!